Kassidy Gorman reaches for a tackle. The senior defender and the Wildcats had an up-and-down road swing. 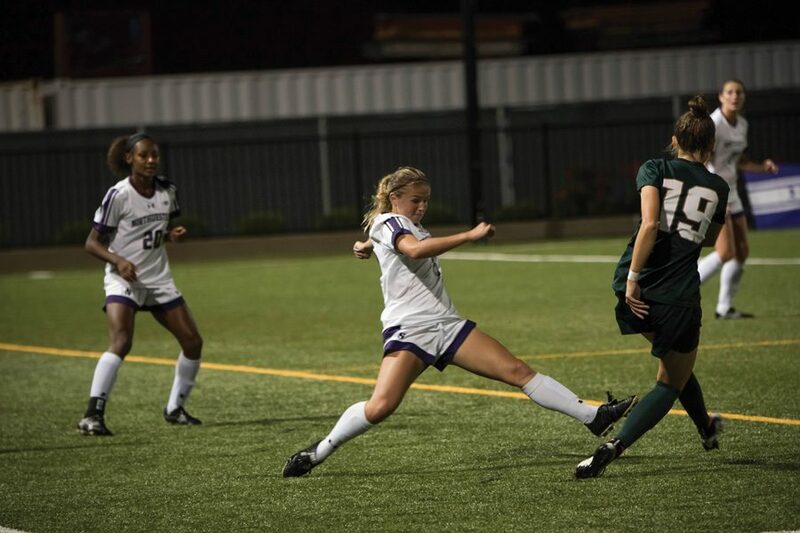 The continued re-emergence of junior forward Brenna Lovera and breakout of freshman midfielder Madi Kennel helped Northwestern (2-1-1) salvage two results on a challenging three-game road trip last week. Kennel’s first two career goals guided the Wildcats to a 3-0 win over Illinois State to start the trip, then Lovera’s first goal since an injury that sidelined her for most of last season earned NU a 2-2 draw against Loyola Marymount to close the trip. The results sandwiched an ugly 2-0 loss to Long Beach State. On Aug. 20 against Illinois State, the Cats dominated to the tune of an 18-7 shot differential and senior goalkeeper Lauren Clem earned her second clean sheet in as many games. The newcomers stole the show, however, with Kennel and freshman defender McKenna Angotti combining to score three second-half goals and Moynihan also praising freshman midfielder Regan Steigleder’s play. But the trip turned sour in California, as NU appeared destined for back-to-back losses until some last-second heroics in the second game. After a shutout loss to Long Beach State in which the Cats were outshot 20-6 and finished the match down to 10 players, the team rallied twice from one-goal deficits against Loyola Marymount to earn what junior defender Kayla Sharples called a confidence-building tie. Junior midfielder Marisa Viggiano first buried a penalty kick to level the score 1-1 early in the second half, but the host Lions answered back four minutes later to retake the lead. Both goals conceded came as a result of headers on the weak side, as Loyola Marymount took advantage of the absence of NU center back Hannah Davison. The hosts’ lead held until, in the 86th minute, Sharples fed a long ball to Lovera, who said she pulled her defender across the field with her, bodied her up, then turned and shot the ball past the goalkeeper’s left to again tie the game. Lovera said the goal represented another step forward in her individual recovery. The Cats are now enjoying a week-long break after returning Sunday night from Los Angeles. Sharples said the team has been working in practice this week at reducing the distance between their forward and defensive lines to about 25 yards, hoping to defend more as a cohesive unit. “We need to work on communicating and getting pressure to the ball in the midfield to they can’t provide a serve, and once it does get to the forwards’ feet, we need to remain calm and have confidence in each other that we can stop them,” she said. Neither Sharples nor Moynihan, however, said they were worried about the team’s recent defensive lapses, instead attributing them to early-season hiccups. NU will next play against undefeated Cincinnati on Sunday, beginning a three-game homestand that will then bring Missouri and Pepperdine to Evanston next week.